Just Julie B's Stampin' Space: Easter is on it's way! Here's a card we'll be making at stamp class this Friday. And yep, Easter is on it's way! This card could easily be for any occasion - just by changing the saying. I like how using the oval gives the impression of an Easter egg - and, of course, using Happy Easter, makes it a great way to have an Easter card without having a bunch of Easter stamps. 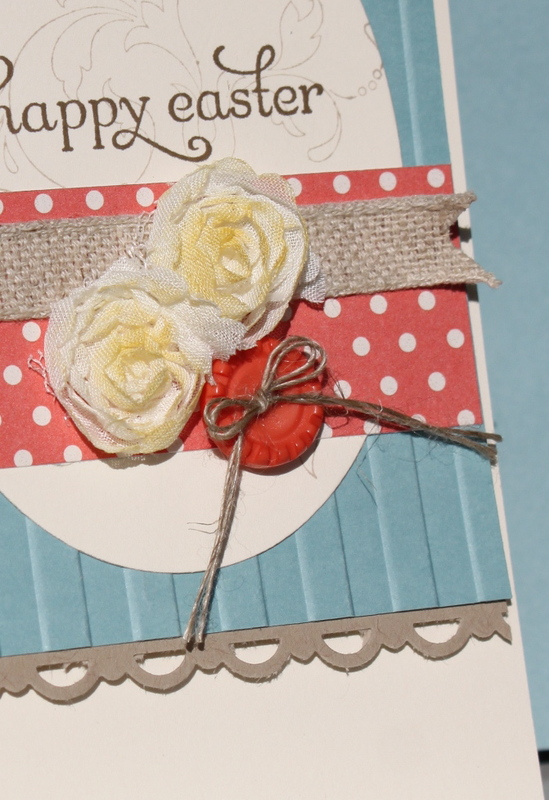 And one of the other cool things on the card is the Flower Trim! I LOVE these flowers, and especially how you can add color to them so quick and easy. They are super pretty all on their own, but adding a touch of color makes them even prettier!! I wanted to let you know that you are featured today in My Favorite Blog list with a link to you site!